To kick off my London Open House round-up, somewhere you'll not be going for a couple of years. 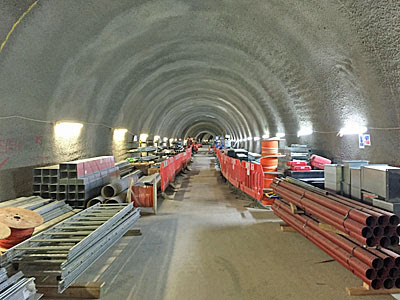 Building a new underground railway doesn't happen quickly, not these days, because there's a heck of a lot to be done. It's now seven years since the Astoria and the other buildings opposite Centre Point were demolished to make way for Crossrail, during which time giant shafts have been opened up, new entrances have been dug out and twin-bore tunnels have been driven through. 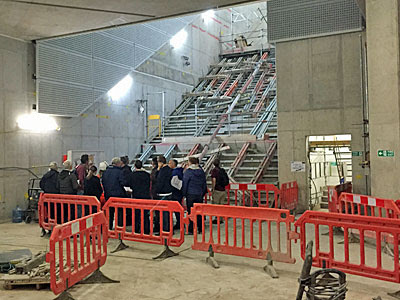 To showcase all the hard work so far, construction company Laing O'Rourke led a select few Londoners below ground for Open House to see current progress, and blimey didn't the tickets go fast? 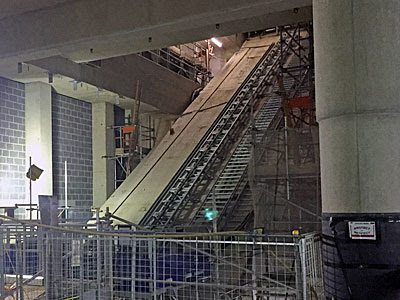 It's a measure of how far Tottenham Court Road's Crossrail fit-out has already progressed that we didn't all need to change into hard hats and hi-vis before venturing down to explore the platforms. Nevertheless there aren't yet any escalators to glide down, nor would it be ideal to take the stairs, so instead we all took the hoist. This judders a little but doesn't take long, and it's how all the workforce (and a lot of the materials) will have headed 24 metres down over the last few years. Once you reach the bottom and walk out, what strikes you first is the cavernous space. 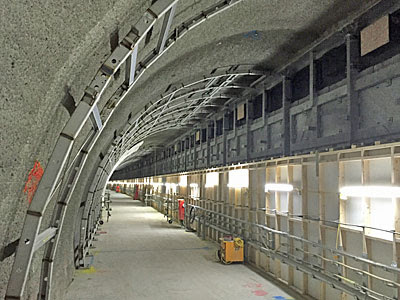 This is very much a feature of all the subterranean Crossrail stations, each designed with smooth future-proof passenger flow in mind, and you'll already have gained some idea of this when TCR's new Eastern ticket hall opened last year. A long, broad escalator bed is in place, six treads wide if I counted correctly, landing closer to the eastbound platform than the westbound. A faintly complex grid of passageways then leads off, this because the two platforms are at least 50 metres apart at this point. One central distributor passageway has been burrowed between the two, which looks like it goes on forever, but in truth not even halfway to the other end. It's broad and arched and has been sprayed with concrete, itself an attractive finish, but you're unlikely to enjoy its texture because I understand all this is to be covered over. A trio of similar-looking cross-passages link through to the eastern ends of the two platforms. At the moment they join at a sharp right angle, but these are being covered over with swooshing curved sections to improve safety and sightlines. Again you'll not notice, but we saw various moulded white panels laid out on the floor and a few already pinned up on the walls, each resembling a stormtrooper's breastplate or perhaps a giant's cricket box. The eastern platform is unique amongst central Crossrail stations in being curved. This became necessary to avoid the foundations of Centre Point a short way ahead, and required some particularly accurate boring when the tunnelling machines dug through. Thus far the tracks are invisible, mainly because they haven't been laid yet, but also because a long temporary screen is in the way. This is to be replaced by a Jubilee-style glass barrier with opening doors, with real-time information scrolling past along the top. And my word, it's long! We're used to tube platforms up to about 130m in length, whereas TCR's platforms are double that - sufficient to stable a nine-carriage train and future-proofed for ten. The curve hides the overall dimensions a bit, but commentators weren't joking when they said it'll be important to try to be at the right end of a train for your eventual destination. Because we were on a guided tour I couldn't time it precisely, but I'd say it'll take the best part of three minutes to walk from one end to the other. The platforms are so long that central Crossrail stations have been designed with two exits, in this case an additional ticket hall on Dean Street. It'll be the minor of the two access points, this because there are no tube lines to interchange with at the western end, but it is likely to be your better option if you're heading to the shops. This time the escalator bed is three treads wide, and will go all the way up in one go, so I wonder if it'll end up with similar "no walking" rules to Holborn? We had plenty of time to look around the western concourse, and to engage the manager and architects in Q&A. One of the joys of a good Open House visit is the opportunity to hear from the experts who've actually been involved in building the place, rather than a volunteer simply reading notes hesitantly off a sheet. We therefore got the full lowdown on materials and structure, as well as the practicalities of construction and just a little nudge at underlying politics, and this really brought the tour to life. Tottenham Court Road's two ticket halls will have subtly different characters, we were told. The Dean Street end will be "dark and cinematic, reflecting the nocturnal economies that characterise the area", whereas the St Giles end will be "bright and well lit to reflect the 1960s iconography of the nearby Centre Point". You can expect a lot of this kind of underlying artistic piffle at stations throughout the route, but if that means the upper levels of each station gain their own particular character, all well and good. At lower levels the design will be more uniform, with a common Crossrail style and palette. And that's what's currently being added to the western concourse, as the original breezeblock shell is inexorably blanketed by more public-facing materials. Several large granite slabs have been lowered down the adjacent shaft and the first two have been affixed to metal brackets in front of the wall, while the rest are scattered across the floor awaiting their turn, By the time the fit-out of this space is complete every single surface we saw will have been covered over, save for the upper half of the supporting columns whose concrete will be left clear. It wasn't possible to exit the station at the Dean Street end, which was good because it meant the tour got to walk all the way back down the westbound platform. This one's straight and therefore more typical, and still daubed with painted codes on the floor and chalkmarks on walls and ceiling. Engineers have also taken the opportunity to lay three slabs of paving, just to see what it looks like and how it performs, as well as installing a single four-seater bench, as yet unwrapped. When you get down here you'll be at least six inches higher up than we were, once the proper depth of platform surface has been laid. What a privilege to be allowed deep beneath the streets of Soho for a sneak preview of London's newest transport system. Indeed Open House has provided several opportunities to do this over the years, but we can't all get that chance, not until Crossrail's central section opens up twenty-seven months hence. Tens of thousands of passengers are expected down here daily, not enough of whom will stop to consider precisely how they came to be down here in the first place. And only a few of us will remember how it used to look along the way.